A mysterious high-tech van with seven cameras mounted along its exterior was parked beside the Town and Country Convention Center. 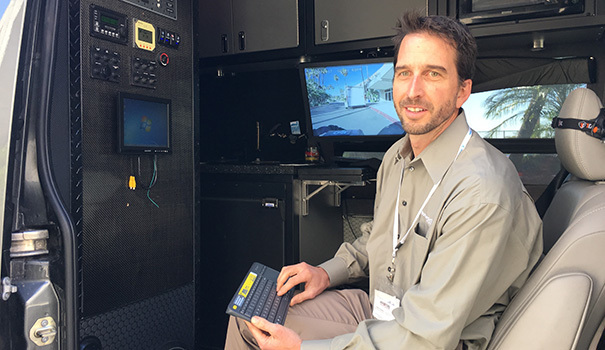 It wasn’t a mobile command center or spy vehicle, but a video demonstration van — just one of the many displays at the inaugural San Diego Security Show, held Jan. 25 and 26 in Mission Valley. Security.World, an online news website, produced the physical security and surveillance exposition which included demonstrations involving surveillance camera housing units, biometrics, video networking, GPS-based personnel tracking, and an ambitious schedule of guest speakers. William Ferris of Point Loma-based Dotworkz was inside the mysterious van to demonstrate his company’s camera housing units. 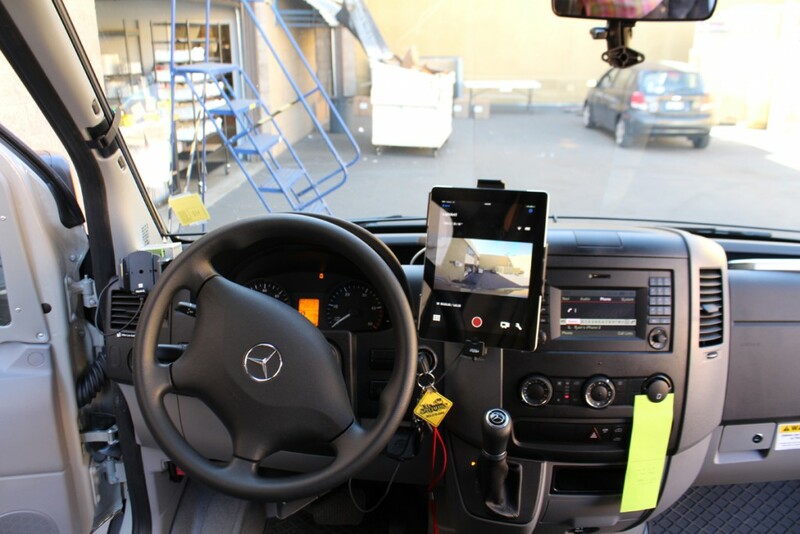 The van’s interior was packed with an assortment of video screens, computer keyboards and control panels. He described the cameras mounted on the outside, including two on the very front. “I’ve got a 4K camera on this. I’ve got an infrared sensitive camera on this one, so the vehicle itself can be driven [at night] while the lights are off,” he said. 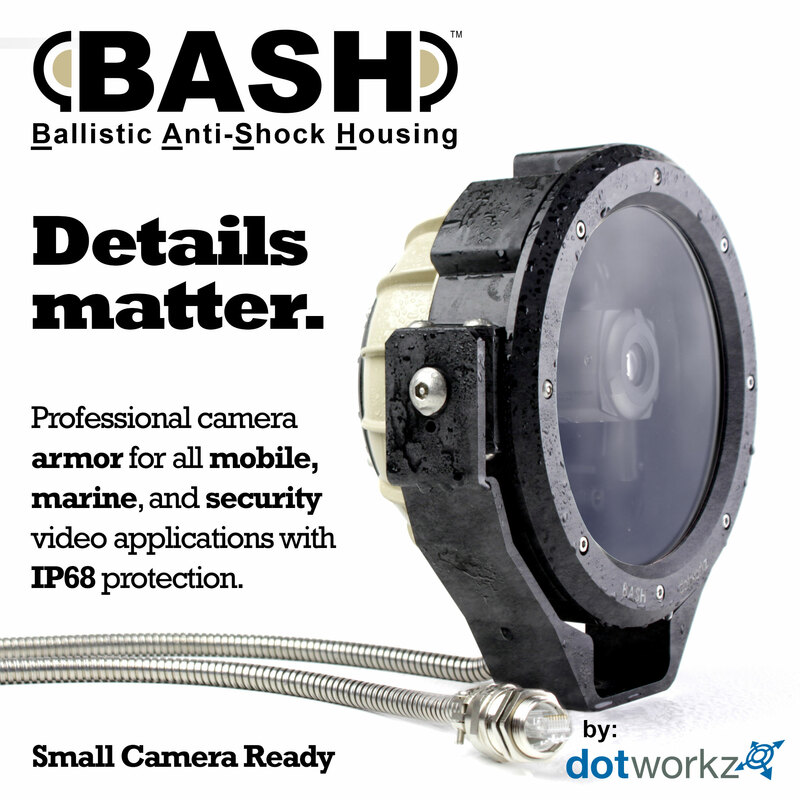 Dotworkz manufactures housings that enable cameras to go in rugged spots where cameras don’t normally go, places like patrol boats in a salt water environment. “Our housings are unique because we have versions that actively cool, so they take heat out of the camera housing. We have camera housings that de-ice,” he said. 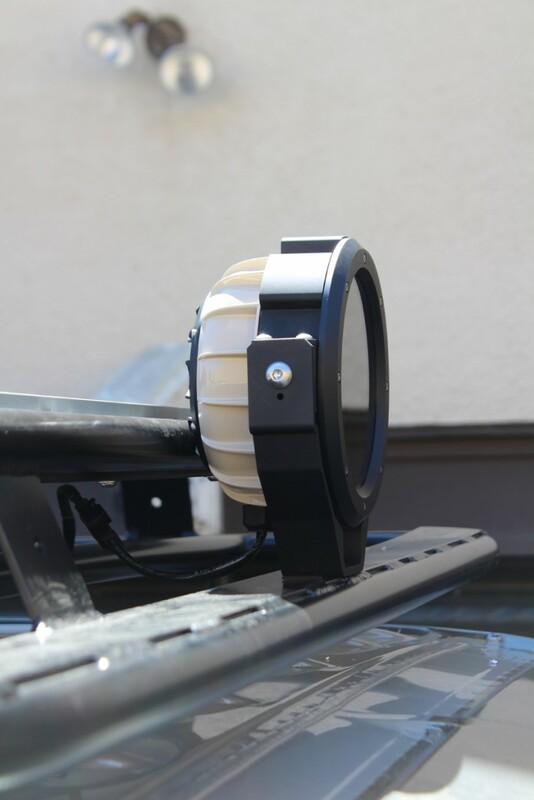 The housings protect cameras for traffic monitoring, fence lines, city surveillance, school districts and police departments. In fact, Ferris said, one of their camera housings was mounted on a pole above a stoplight to monitor traffic just down the street on Fashion Valley Road. The entrance to the Town and Country’s exhibit hall featured a facial recognition device. Visitors could center their eyes in a digital green box on the small screen to record their facial traits, then Plexiglas gates of the turnstile would open to allow entrance. This technology is known as biometrics — the measurement and statistical analysis of physical characteristics. 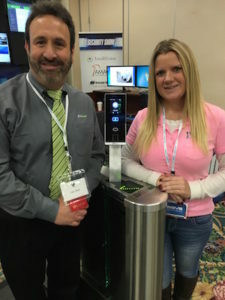 Two companies joined forces to demonstrate the entry control technology: Delta Turnstiles, LLC of Concord, California; and ZK Access of Fairfield, New Jersey. Vanessa Howell, representing Delta, said her company manufactures optical turnstiles and makes smart machines that integrate with ZK Access biometric vision readers. Larry Reed, the CEO of ZK Access, explained the facial recognition exemplified by their turnstile demonstration is just one example of biometrics. “Biometrics is using a biological characteristic that’s unique,” he said. Examples are fingers, the iris or retina of the eye. Once your traits are recorded, the biometric reader will allow you access. Biometric readers for access control can be used for doors, gates, elevators and vehicles. It’s better than using an access card, Reed explained. “While a card can be lost or stolen, you can’t lose your face,” Reed said. Darren Giacomini and Chris Haun gathered around what looked like a large storage trunk standing on end with multi-colored cables connected to a bank of large video screens behind them. Giacomini represented Avaya, a digital business communications company, and Haun was from BCDVideo, a company specializing in storage and protection of surveillance video. 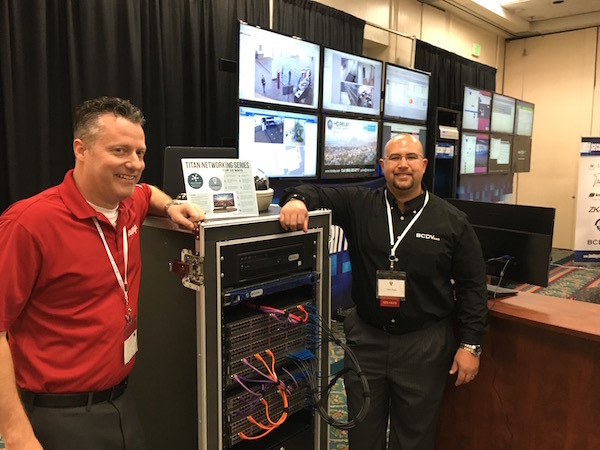 The companies partnered to create Titan Networking, a line of video surveillance switches powered by Avaya’s network operating system software called Fabric Connect. The result of this joint venture is run-around technology that foils interruptions to video feeds. Giacomini demonstrated by unplugging a cable attached to the network box from a live surveillance camera. A look at the video monitor on the wall did not show a noticeable delay in the picture and the video feed remained uninterrupted even without the cable attached. Craig Park of Carlsbad-based Trak Assets explained two of his company’s GPS-centered products with the purpose of tracking personnel. The first, named Trak Time, works on a cell phone, tracks unsupervised personnel, and acts as a time clock and time sheet report. It has a “geofence” that can be drawn around the work area so that the employer can determine the exact position of a worker within a building or property. Trak Assets’ other product was called Lone Worker and is meant for personnel working in dangerous environments. This also works on a cell phone and is useful when sending personnel into isolated areas alone. It’s helpful for special law enforcement agencies, the military or even utility companies. Movement parameters for position reports can be set in advance. The individual can be required to check in on a scheduled basis and an alert will be raised if check in is missed. A feature called Smart Man Down issues an alert if the individual remains motionless for a certain amount of time, and an S.O.S alert can be sent to preset destinations such as to 911, a boss or a commander — and a beacon will indicate the person’s exact location. One of the most anticipated forums of the security show was titled “Things that Keep You Up at Night.” The first subject was physical security challenges. “Just about everywhere you go is a soft target,” said Scott McCartney, project director of the Large Stadium Initiative and Active Shooter Training coordinator with the California Governor’s Office of Emergency Services and Homeland Security. San Diego Police Department (SDPD) Chief Shelley Zimmerman referred to San Diego’s event-filled month of July 2016 as an example of a challenging time to keep the public safe, having multiple soft targets to protect. July’s four weeks of mass gatherings in the city included the crowd-heavy Fourth of July weekend, the Major League Baseball All-Star Game, Pride Week and Comic-Con. She said the SDPD utilized surveillance cameras to watch the crowds, and explained the importance of using physical barriers, including the positioning of police vehicles. She also said placing SWAT teams in over-watch positions was very useful and added to the command posts receiving real time information during the events. In addition, she credited the cooperation and coordination of local, state and federal law enforcement agencies as being critical. Zimmerman said that with social media tools such as Facebook and Periscope, there is always the possibility someone bad might share SDPD’s tactical information in real time. “Technology has gone so fast, information is shared so quickly,” she said, adding that such technology was making things difficult for law enforcement. Laura Hart, vice president of business operations for Qualcomm, defended the development and accessibility of such technology. She said she prefers to look at technological development as a way to to solve problems. Hart said technology is developing so fast that major breakthroughs will come in the next 10 years. For example, she said 5G networks are on the way. McCartney wondered if the not-so-distant future might begin to look like the old cartoon show “The Jetsons,” which parodied the future. “How do we know we won’t have cars floating [above] the street?” he said. Mike Sannella, in charge of corporate security for LPL Financial, said he recalled a time when security personnel on duty didn’t have communications devices of any kind, as compared to today’s reliance on technology. “I have a smartphone that will do everything I need in a law enforcement capacity that my office computer or car computer can do,” Sannella said. The internet has connected people so much, Zimmerman said, that “when something happens across the world, I get a notification,” adding that she must always ask herself if it is some kind of globally-coordinated attack that could happen in San Diego as well. “When something happens at a military installation, I’m immediately on the phone,” she said. —Reach John Gregory at john@sdcnn.com.